Queen Victoria (1837 – 1901) – Victoria reigned during the height of the Industrial Revolution. Her reign was also marked by a great expansion of the British Empire. Victoria died in 1901, after a reign of almost 64 years. King Edward VII (1901 – 1910) – Edward VII succeeded the throne, on the death of his mother Victoria. His reign heralded significant changes in technology and society, including powered flight. Edward died in 1910, after reigning for only nine years. King George V (1910 – 1936) – George V ruled throughout World War I and while other empires in Europe fell his expanded to its greatest extent. He celebrated his silver jubilee in 1935. On his death in 1936 he was succeeded by his son Edward VIII, who was to abdicate later that same year. King George VI (1936 – 1952) – After the abdication of his brother, George VI was called to the throne. George would reign throughout World War II and acted as a figurehead keeping up the moral of his armies and people. He died in 1952. Queen Elizabeth II (1952 - ) – Elizabeth II’s reign is one of the longest in British history. During this time Britain’s role in the world has changed irrevocably, while the country itself has undergone a fundamental transformation. 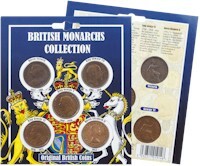 This British Monarchs Collection coin pack contains 5 original penny coins all held in a clear blister on a card. The card has the image of the Royal coat of arms on the front and historical information on the reverse.